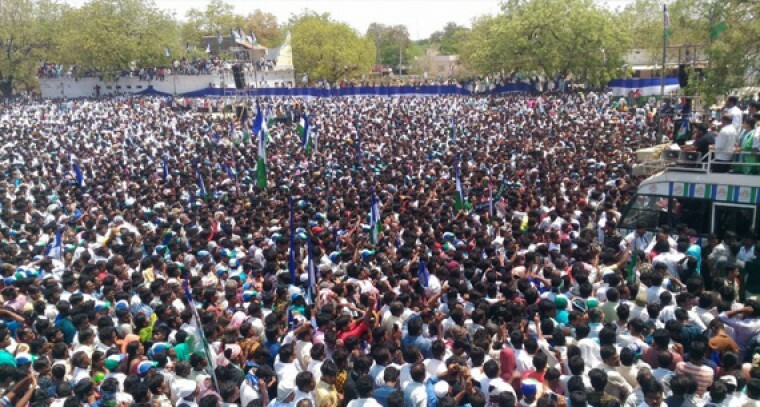 Kadapa: While exuding confidence over his party voted to power in ensuing elections, YSR Congress president YS Jagan Mohan Reddy called upon the people to be vigilant as TDP is hatching a conspiracy to prevent YSRCP victory by creating law& order problem in the state. Addressing the public meeting at Pulivendula on Friday he alleged that Chandra Babu Naidu has ordered his party men to create law& order problem so that it would be made applicable to YSR Congress to demoralized it in the ensuing elections. Jagan Mohan Reddy alleged that JSP has no specific political agenda as it's president Pawan Kalyan performing electioneering behalf off TDP by a reading script written by Chandra Babu Naidu in his campaign. The YCP leader claimed that he feels proud to born in Pulivendula as he learnt many things how to face challenges when suffered from troubles. He alleged that TDP is responsible for brutally killing his uncle YS Vivekananda Reddy, but unfortunately, it is trying to divert the attention of people in the name of police enquiry which creating scene it was done by family members. He said in this circumstances there was the possibility of arresting YSR family members at any time by police. "I have no option to have put belief in god and depending on people. I am appealing people living in rural areas to ensure for smooth conduction of election in Pulivendula constituency". He recalled that people of Pulivendula have extended their support to YSR family to face Congress party bravely after losing YS Rajasekar Reddy.